Over the last couple of years, a range of healthy little snack bars has been inching its way into our everyday lives. Nakd bars (or Larabars as they’re known in the US) bridge that gap in the sweet treat on-the-go market between an apple and a chocolate bar. They’re small but mighty, packed with energy in the form of good fats and natural sugar, and despite their hippy credentials are now available to buy in supermarkets and service stations all over the country. Ever since I first made Green Kitchen Stories Hemp Protein Bars a year or two ago, I’ve been a fan of homemade bars like these. You know exactly what’s going into them and can mix it up with different protein powders, spices, nuts and seeds. You can also cut them larger than the ones you can buy in the shops if you’re feeling greedy and although I’ve not done a cost analysis, I’m pretty sure it’s cheaper to make your own as well. Recently Carnivorous Husband has been on a Nakd Cashew Cookie kick. As Nakd helpfully give the percentage of ingredients on the back, I had the recipe for this homemade version in seconds. Although I usually find it hard to resist the urge to tweak a recipe, adding a little bit of spice, some salt or a scrape of lemon zest, I wanted to stay true to Luke’s favourite snack so here it is in all its two ingredient glory. Enjoy. 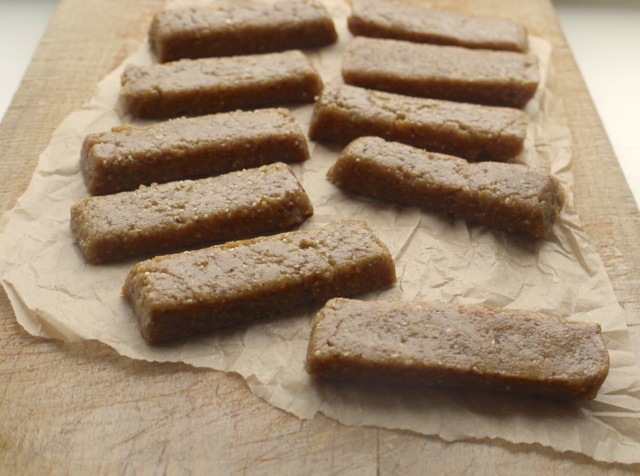 With just 2 ingredients, this homemade version of Nakd's Cashew Cookie bars (Larabars in the US) takes minutes to make. A deliciously sweet and healthy snack for when you're on the go. Line a 20 x 30cm baking tin with cling film. 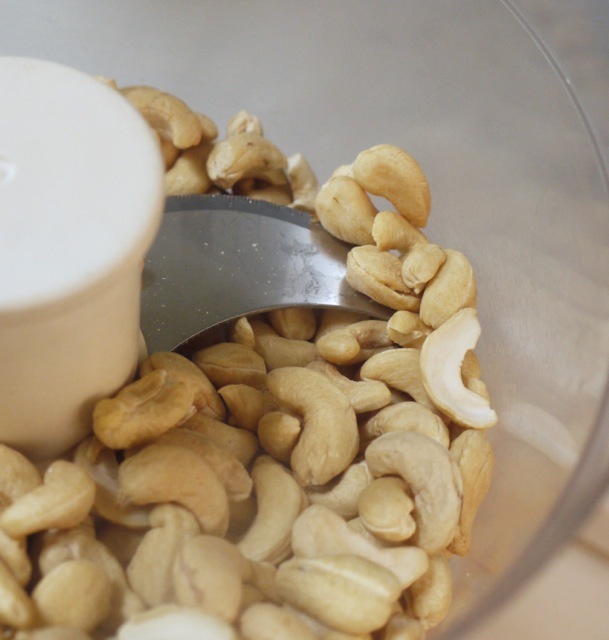 In a blender or food processor, blitz the cashews until a fine powder forms. Add the dates and continue to blitz until smooth and well combined. Press the mixture evenly into your prepared tin and refrigerate for 30 minutes. Turn out of the tin, remove the cling film and cut into bars. Wrap in greaseproof paper and store in an airtight container in the fridge for up to one week. 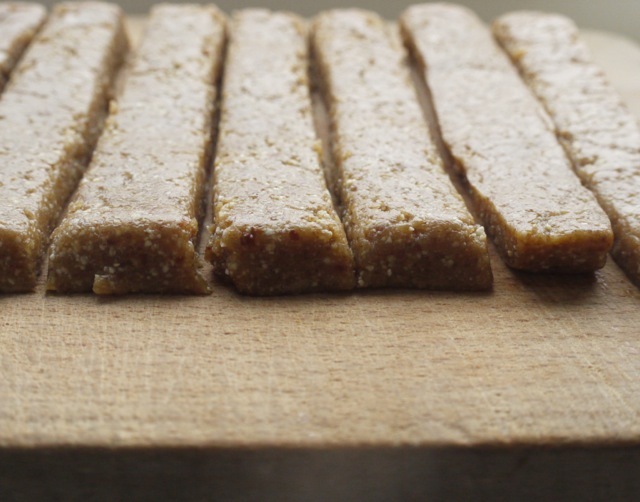 Love the simplicity and clear flavors of these bars! The perfect energy booster to carry with you at all times. Cashew cookie is my favourite flavour 🙂 It’s always a bonus when Nakd do offers on their boxes! I’ve always wanted to make my own-may have to try this weekend. I had no idea that these were so simple to make, definitely going to try them. It’s so useful having a stash of healthy + nutritious snacks on hand. They’re so simple to make and you can throw in whatever you fancy – different nuts, dried fruit, spices, cocoa or even puffed rice for crispiness. I love this! I used to buy Nakd bars when I was running a lot more as I liked the short ingredient list and the big energy boost they provide. Once I discovered the backside of the wrapper tells you the proportion of ingredients, I started making my own at home as well. Cashew cookie was a favourite of mine as well. Eventually I started looking at the Larabar website for flavour inspirations and so blueberry muffin bars were born (with oats, vanilla and dried blueberries) and a bounty version (with coconut and small chocolate chips). To this day I have never actually eaten a larabar – although I know I can make them at home, I actually just bought one yesterday here in NYC to try them out! What’s your recipe for the Bounty version they sound fab! I’m busy developing a line of protein balls. Strawberry and poppy seed, and Bakewell tart flavour. I think these new “naked”/natural sweets or the future. As you’ve demonstrated beautifully, so easy to make and good if not better than anything Mars make. 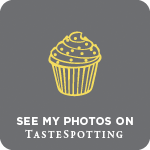 Looks scrumptious, Kate! Kashews and dates are heavenly together, simply brilliant. Yum Yum! 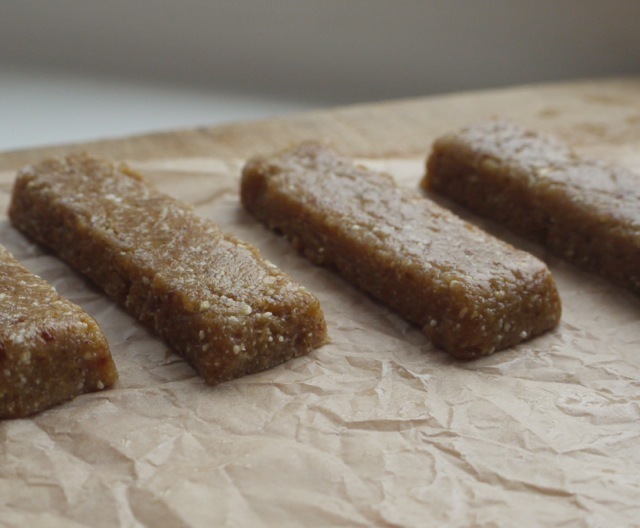 I love Nakd bars and have been wanting to have a go at making my own for a while. You have inspired me to try (my favourite is the cocoa orange). Did you find the dates blended okay without being soaked? Snap I make these too! (http://temilasade.com/2014/05/27/homemade-nakd-bars/) I love Nakd bars, but they’re not readily available in Australia, and when you can find them – they’re so expensive! Need to invest in an processor asap so I can whip these up and enjoy them again. I do wonder though – mine never seem to stay as firm as Nakd’s do…probably because they’re so much fresher? I’ve had a look at your recipe and you include a little water, which I think could make them softer/soggier? I store mine in the fridge but even out for a few hours they stay pretty firm. If you have a powerful blender you should be able to process without any additional water? Hope that helps. I don’t think I’d ever appreciated how straightforward these were to make- you may find a few distraught emails from the makers of nakd bars bemoaning the drop in sales! What an easy recipe, I must try these bars! After realising that cereal ‘health’ bars that you buy from the shops are in fact full of sugar, I started making my own snack bars and after many many many recipes I finally have one now that I go back to time and time again! Has anyone tried freezing these bars? Think I may try them for my teenage daughter but there’s too many to eat in 7 days! Hello, would regular dates work as well, and would you use the same quantity? Thank you. Regarding the comment above, I would think the natural sugars in the dates helps preserve them – Nakd bars are the same ingredients and have a pretty long shelf life. Thanks for the tip! Can’t wait to try these – will let you know how they go. Do you use roasted or raw cashews? I have tried to following this recipe but keep getting it wrong! The mixture keeps coming out too dry – almost like sawdust. It gets a little better when I press into a mould but still no where as yummy as yours look! I have added a little hemp protein powder (about 10g per 100g) but am still using 50g of dates per 100g of mixture. I added the powder as I struggle to get enough in my diet. Maybe the dates are not fresh enough? Maybe the powder is causing the issue? I only have a blender also – not a food processor. Could this cause the problem? Sorry for all the questions and thanks for any help you can give! Hmmm, how odd. 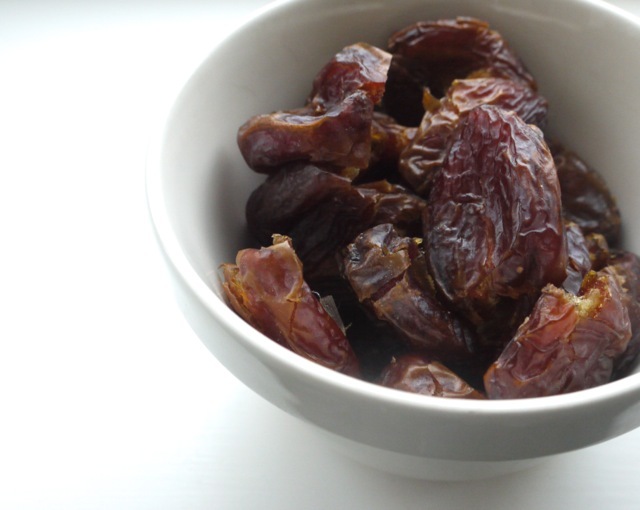 It’s probably the dates – use the super soft medjool dates if you can as they will give these the [erfect texture. Adding the protein powder is probably another reason why they’re dry. Hope that helps! Any thoughts on how to get these less greasy like the ones you buy in the shops? I have just made my first batch, not sure how many there will be but hoping they’ll work out at 50p each to be as cheap as Aldi’s equivalent of 65+p Nakd ones! At approximately £8 to make, these are fabulous at 35p each! How long can we store these bars for? Up to a week in the fridge. I have same issue. The mixture is very oily. I’m going to try dehydrating. Is it possible to freeze these? just made them and they are fantastic. They taste as good as nakd bars.